Recipe from "Toronto Cooks: 100 Signature Recipes from the City's Best Restaurants" by Amy Rosen. 1. In a bowl, combine maple syrup, soy sauce, and chipotle. Set aside. 8. 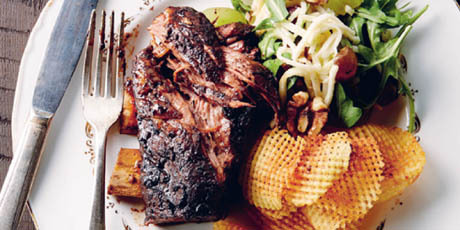 To finish short ribs: Preheat oven to 425°F. Place ribs, reduced cooking liquid, and 1 cup of cold water in a Dutch oven or roasting pan. On the stove over medium-low heat, bring to a simmer. Transfer to preheated oven and cook, for 25 minutes. 9. Remove from oven. Transfer ribs to warmed serving dish or plates. 10. On the stove over medium-high heat, reduce liquid in Dutch oven to a syrupy consistency. 1. On a mandolin, using the waffle blade and turning the potato a quarter turn after each cut, slice potatoes to a thickness of 1/16 inch. Immediately place slices in cold water until ready to fry.